The day planner strikes most of us as a straightforward piece of technology. Whether it’s a smartphone app like Organizer HD or a paper DayRunner, the planner offers a clear way to look ahead and impose order and predictability onto our time. But a planner is more than a tool: It’s also a way of seeing the world. The way it organizes time, what it prioritizes, how you choose to fill it in—all of these things reflect a set of values, and one that has changed since the planner was born. Planners go back more than two centuries, and as the nation grew—and became busier, and its people more ambitious—day planners grew with it. What began as a highly personal approach to keeping a diary developed into a whole industry. A tour of the American daily planner from the nation’s founding into the 20th century offers a unique window into the preoccupations of a people, and explains the staying power of an ingenious, but deceptively mundane, design. Before the American daily planner came a Colonial bestseller, the almanac, modified into a diary. 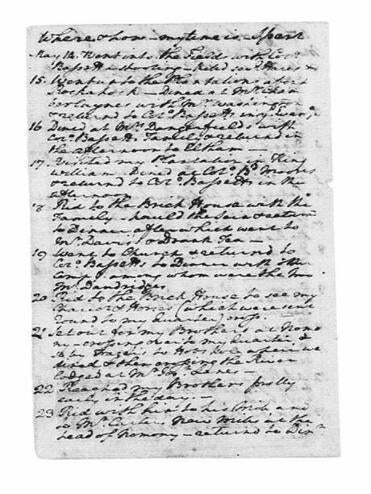 Washington, like other Founding Fathers, interleaved his own blank pages into his copy of the almanac, an indispensable calendar and local guide that provided Colonists with the times of sunrises and sunsets, lists of local inns, postage rates, weather predictions, and much more. Each day Washington noted in the book where he rode, who came to call, and with whom he dined. Though not a planner per se, the almanac-diary foreshadowed its abbreviated qualities and rigorous daily structure. Where a modern day planner is chiefly concerned with organizing time for the future, we know from their writings that Washington and his contemporaries saw their daybooks as a record of the past, documenting words and deeds that were ultimately accountable to God. 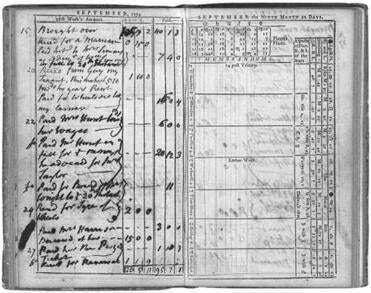 “Keeping account” carried a dual meaning in this Colonial era, in which a diary—as planners are still known in British English—could serve both earthly and more spiritual goals. In 1773, Robert Aitken, an aspiring publisher in Revolutionary-era Philadelphia, published what he claimed was America’s first daily planner, offering his customers a prefabricated layout not unlike the planners of today. For the first time ever, Americans could see their days laid out before them and plan ahead beyond the almanac’s generic predictions. 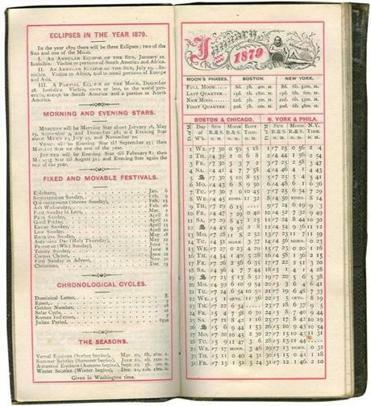 Aitken’s format organized the year a week at a time, and its layout shows that from the first, planning was intimately connected with business: Customers could record their expenses on one page and appointments and memos on the opposite. Unfortunately for Aitken, his planner was a bust, a victim of turbulent times and a clientele not yet ready for the product. Eventually, planners did take off. In a busier and more industrial America, people had begun to realize that mapping the future would be critical to getting ahead. By 1850, diaries and other varieties of blank books—scrapbooks, ledgers, account books—had become big business. In an 1844 list of taxpayers, two Boston businessmen ranked at the top with $100,000 or more in taxable wealth: One was an editor, the other a blank book manufacturer. Popularized by Union soldiers who carried them into battle, the daily planner emerged in the post-Civil War era as a national basic, sold under names like the Standard Diary and the American Diary. The mid-19th century witnessed the democratization of the books, as the working class and women discovered a format initially intended for well-to-do men. Planning still came with a kind of moral engine. Etiquette manuals urged readers to “improve the time” and promoted the daily planner as a sure and steady path to self-improvement. Compared to Washington and his contemporaries, these new customers exhibited a more secular, self-centered vision of their purpose on earth, reflecting a middle-class ambition to rise up through hard work and thrift rather than a religious ethic to hold themselves accountable to a higher power. In 1900, department store magnate John Wanamaker had an innovative idea: Why not pair the popular daily planner with his own store catalog? 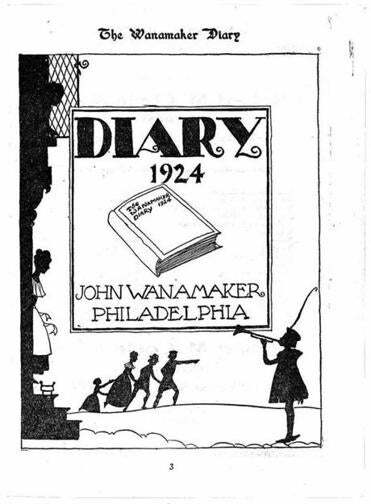 Known as the Wanamaker Diary, Wanamaker’s marketing innovation offered his customers a luxe diary underwritten by ads. Its popularity suggested that American consumers were now perfectly accustomed to flipping through ads as they lived their lives. The Wanamaker Diary was a more sophisticated version of the patent medicine almanacs of the previous generation, and an antecedent of today’s upscale American Express appointment books. multimillion-dollar industry devoted to planners. The elaborate planners that underlie the FranklinCovey time-management empire still mingle logistics and a philosophy of business success. And in a testament to the daily planner’s simple effectiveness, the vast majority of electronic versions simply replicate a paper calendar—using a $600 smartphone and all the power of the Web to create something that Robert Aitken would have recognized perfectly well.